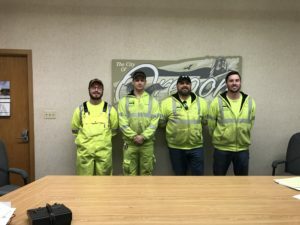 The Oregon Street Department strives to make travel fast, safe, efficient, accessible and convenient for residents and visitors by thoroughly maintaining streets, alleys and sidewalks in a high state of repair following guidelines established by the Federal and Illinois Departments of Transportation that enhances the quality of life today and into the future. Oregon has 25 miles of paved streets, 2 miles of paved alleys and 4 municipal parking lots and we currently mow over 8 acres of grass areas. We are the only City in the region which does extensive hot mat asphalt patching before our annual sealcoat (tar and chip) program. We use an annual average of 250 tons of salt and 250 tons of limestone chips (mixed 50/50) for ice control and pride ourselves in having our streets cleared of snow before the communities around us. We are the only City of our size whose dept. has itself designed and installed catch basins and storm sewer to drain low areas. In addition, we are the only City in the region which annually inspects and cleans these basins – and replace/repair them ourselves when needed. 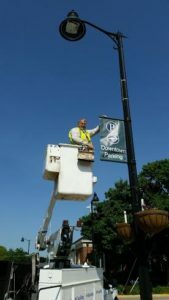 The Street Department has 4 full time employees and 1 part time seasonal employee. We do the vast majority of maintenance and repairs to our vehicles and equipment in-house. Because of our broad experience, we are often called when unique needs arise which aren’t assigned to department by ordinance.